Well, most of the kids are back in school. How many of you did a happy dance when school started? Elizabeth is off to college. We won't see her until Thanksgiving break. I must say I have been disappointed in this year's summer. It was very soggy and not very warm. I didn't spend much time in my swimming pool this summer. Mom got it it emptied and still has to clean it and put a little water in to keep it from blowing away. But the pool is pretty much ready for winter. The nice thing about the cool weather we've been having, Mom & Grandma have left the back door open so we can go outside play and do other things whenever we want. Moda and I had a few cases of zoomies today. We chased and zoomed around the Shop and out in the backyard a few times today. We had a friend bring a little girl over to play with us. We "attacked" her with lots and lots of doggy kisses. We had fun with her. I'm seriously thinking about an afternoon nap after getting the newsletter done. 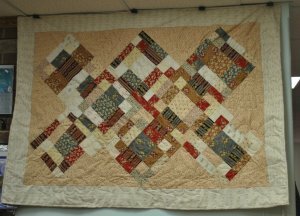 We have gotten in Quilting Treasures "American Honor" collection. Mom, yes, you read that right,made up her own little quick pattern using the fabric. 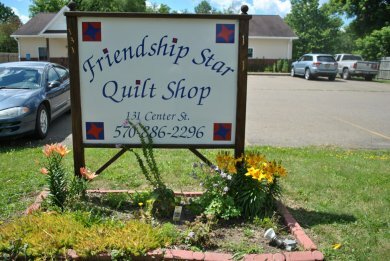 It is a small collection but very nice for quilts of valor. Or a wall hanging. Veterans Day will be sneaking up on us before we know it. Don't forget, Saturday is our Free Pattern and Demo Day! Yes, it's the first Saturday of September. Coming up for the first full week of September, we will have 20% Off Flannels. Our September Class Schedule is up next! 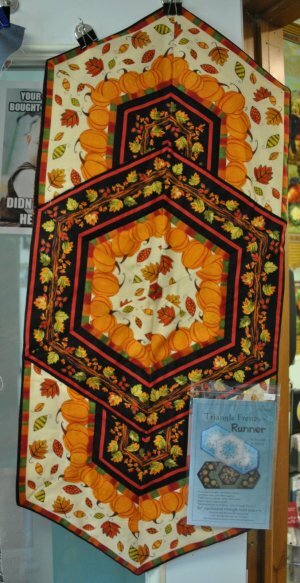 Saturday, September 1 Free Pattern and Demo Day Get a free pattern and learn how to make it. would make a great quick lap quilt. 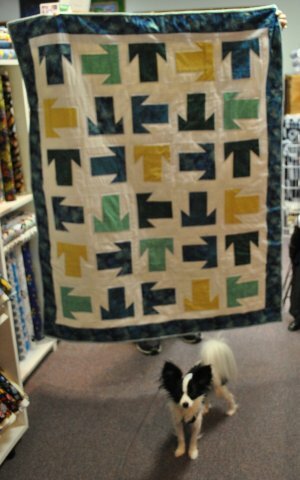 for this cute lap quilt. Saturday, September 30 The "Magic" half square triangle. The half square triangle is so versatile. 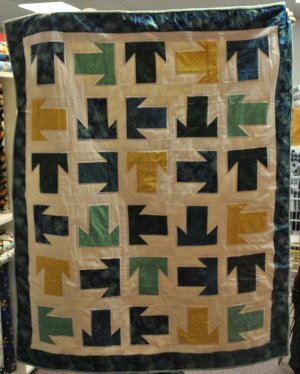 Learn several techniques for making them and putting them together in quilts. Here is a sneak peek at one of our classes coming next month. Well, that's all for now, quilters. It's time for a quick nap before going home to play with my dog sisters.